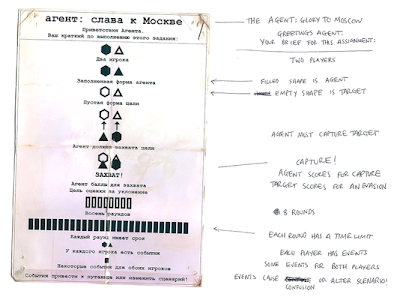 The concept is simple; two people play a game of cat and mouse — or the Russian cold war equivalent, agent and target. 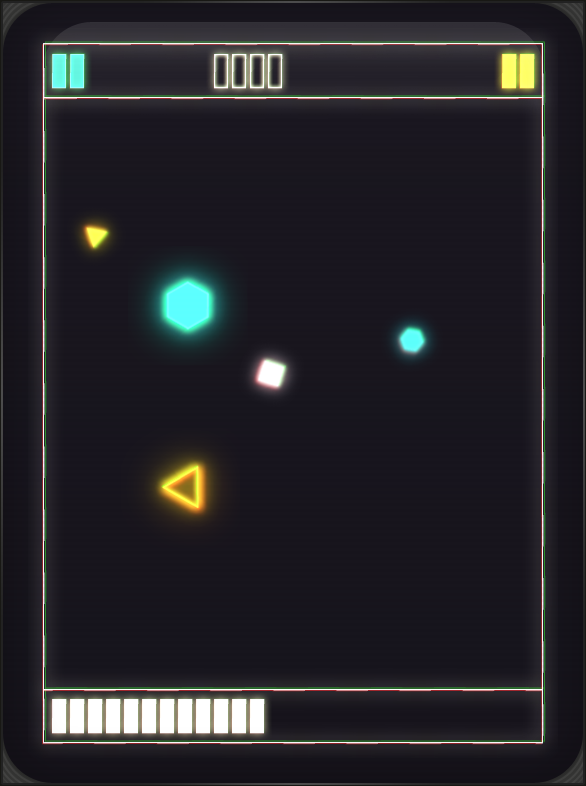 One player is assigned the role of the agent (represented by a filled shape) and must capture the target (the outlined shape) which is controlled by the second player. The twist is you swap roles with each capture. So you're either chasing your partner around the empty, Vectrex-style rectangular playfield or you are avoiding capture. After eight rounds the game ends. There's a timer counting down each round which forces you to work quickly. To mix things up, pick-ups randomly appear in the play area, affecting gameplay by either speeding up movement or swapping player roles and positions. 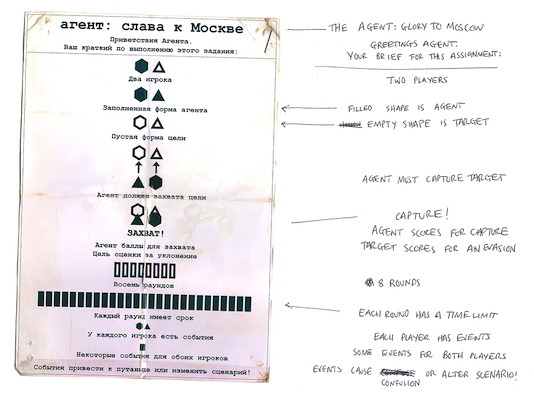 To present this as an authentic recreation of a Russian game, all of the text including the documentation is in Russian. The download is accompanied by a PDF file that contains what looks like a scan of an original instruction card, complete with a hand-written translation alongside it. While it does add to the charm of the package, you'll have to experiment a fair bit to figure out what's going on. That can be frustrating but I think it works to the game's advantage as you and your partner will initially work together to make sense of it. Once you've figured out the mechanics though, The Agent fast becomes a cutthroat battle. The game's graphics reproduce the impression of genuine colour vector hardware with very impressive results. I'm a sucker for glowing vectors and the ones presented here even shimmer a bit simulating the light beams hitting the screen. 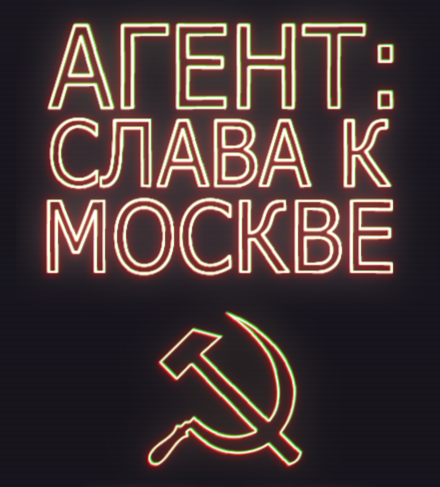 The time constraints whilst developing the game have resulted in a minimalist presentation that effectively echoes the no-nonsense, no-frills society of cold-war Russia. The audio is outstanding, with a timeless electro soundtrack driving the play and rigid snares reminding you this is a serious Soviet affair. The single track repeats from the moment you launch the game but is long and varied enough so that it doesn't immediately become monotonous. This is also helped by the short play time; your eight rounds will be over in about a minute. Despite being slight in terms of content, The Agent: Glory to Moscow is fun as a brief diversion when you don't feel like getting wrapped up in intricate mechanics and complex decisions. It's a two-player only affair, there's no computer-controlled player and you both need to intimately huddle over a single keyboard or share the thumbsticks on an Xbox 360 pad. The Russian text will force you to experiment in order to understand the premise and even then you'll still be occasionally scratching your head. 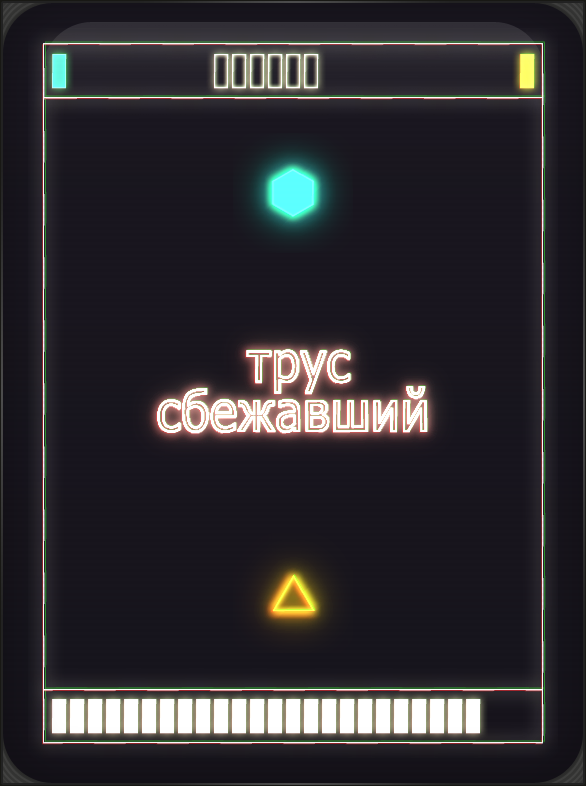 That is the only real downside to the game; although it would ruin the almost surreal experience, I do wish that it had been presented with an option for English translation inline with the Russian text so you know what's going on. Download the game here (from the Force of Habit website).